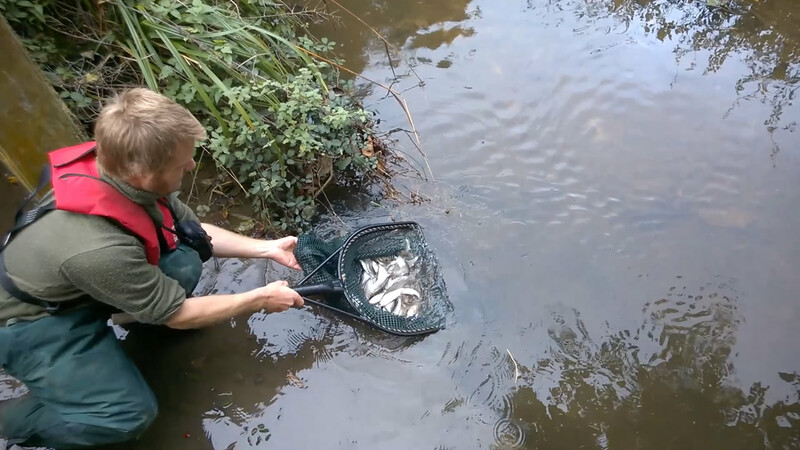 On Thursday, 23rd October, CATCH reached the high point of its fledgling existence when the Environment Agency delivered 2,500 fish – a mixture of roach, dace and chub – to be released into the River Cale, as they have deemed it now capable of supporting the extra wildlife. This, the EA have said, is directly as a result of CATCH’s efforts to improve the river. 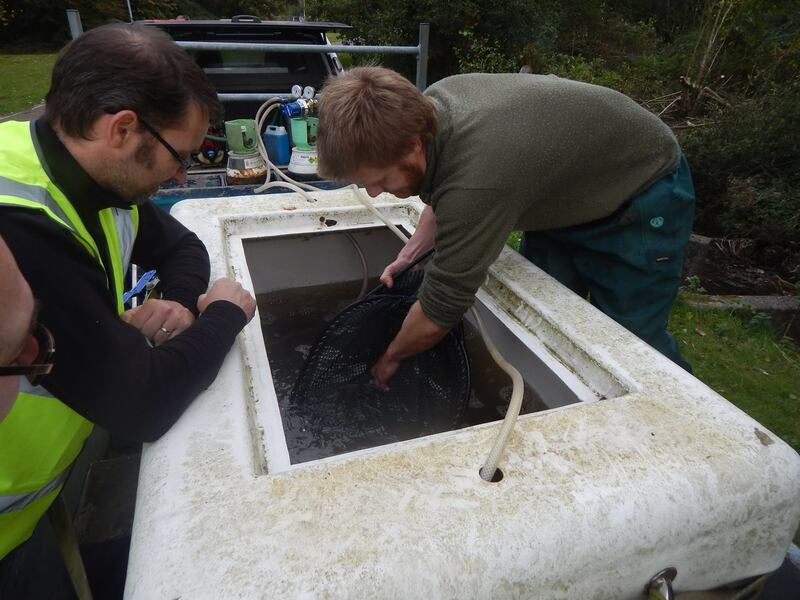 The fish, bred in Environment Agency farms, are all roughly eighteen months old and it is hoped that some of them will spawn next spring, ensuring a plentiful supply of fish for the foreseeable future. 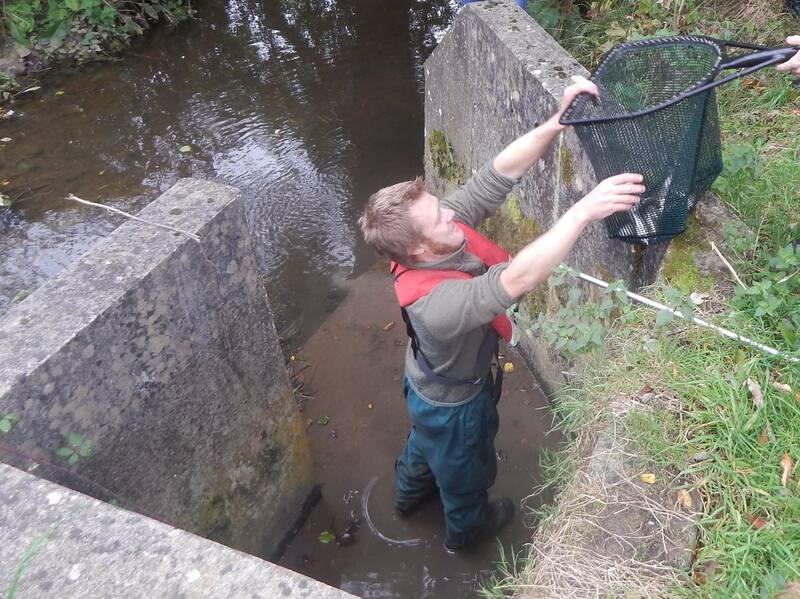 Jim Allan, the EA representative who joined us 18 months ago to walk the Cale and survey its condition, arrived in Wincanton that morning and released about 1,500 of the fish into the river downstream of Hawker’s Bridge. The remaining supply was brought to the Recreation Ground shortly after lunchtime, where the CATCH team were joined by children from all three of Wincanton’s schools to watch them being released into Skater’s Curves. The children were, indeed, able to be actively involved, taking turns to carry a net full of fish from the storage tank and hand them over to Jim at the riverside. While waiting their turn, they also showed a keen interest in the information on the CATCH stand, while Gary and Matt talked to various groups and some interested passers-by about CATCH’s history to date, the background history of the river and some details of the wildlife and plantlife it supports. 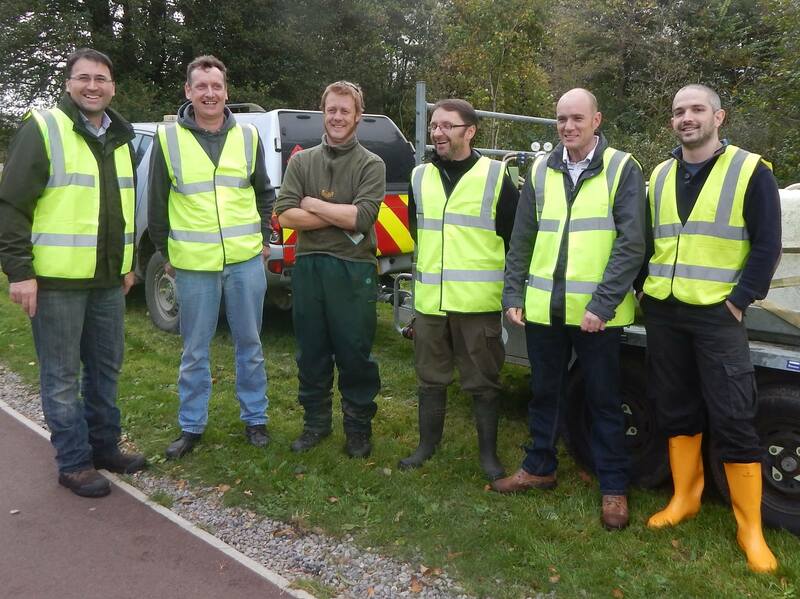 Reports of the fish release were later to be found in various local media, notably the Western Gazette and Blackmore Vale magazine and the Wincanton Window online news site, and Matt went on to give an interview on BBC Radio Somerset that evening about our work and the events of the day. Jim Allan and CATCH celebrating a job well done. This release marks a major triumph in CATCH’s efforts to regenerate the Cale; which efforts would not be possible without the support of a great many people and local businesses, for which we give our unreserved thanks and appreciation. Our regular surveys of the river will help to keep an eye on the progress of its new residents, and we hope to be reporting on newborn arrivals some time next year. A video of the proceedings is available on the Wincanton Window’s report, which can be found here.